Phnom Penh (FN), Jan. 20 - Phnom Penh Municipal Court Judge Mong Mony Sophea ordered on Sunday to detain former opposition activist Kong Mas in Prey Sar prison waiting for the trial. Kong Mas was allegedly charged with public insulting and inciting under the Penal Code. Opposition activist Kong Mas, 37, was born in Romeas Haek district, Svay Rieng province, and was arrested on 16 January 2019. According to the interrogation report, police found many evidences in his computer, the documents plotted to overthrow the Royal Government under the command of President of Cambodia National Rescue Movement Sam Rainsy. 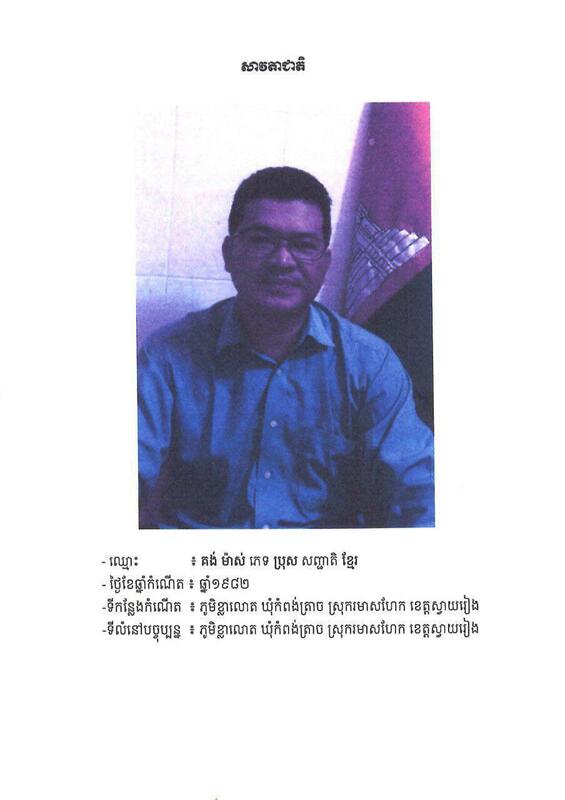 On 14 January 2019, prosecutor of the Phnom Penh Municipal Court (PPMC) Keo Sothea ordered Kong Mas to appear at the Ministry of Interior's Security Department by 14 February 2019 for questioning on criminal complaint: insulting the government and inciting the public for hatred against the government using video clips on Facebook.